Every one of us knows that certain person who jumps from relationship to relationship, and every time, they tell you, “I am in love. As someone who has spent a good part of her adult life single, I could never understand how someone could be “in love” with all those other people. I assumed that it couldn’t be love because it was the fear of being alone. I mean, that’s right. Right? Sort of. You can’t measure love with any real calculations. It’s something you just feel. But what if your feeling isn’t right? What if you are just so afraid of being alone, or so tired of not feeling a connection (regardless of how brief), that anyone who gets close to making you feel safe feels like they are your soulmate? You know those relationships in the past; the ones you look back on and say, “I can’t believe I told them ‘I love you’.” How could you have said those words to someone who isn’t your type, and who you wouldn’t ever want to been seen with again? The answer is, that wasn’t love. That was attachment. I am not a love guru and I have no way of telling you if what you’re feeling with your current partner is love, or just loneliness masked in body spray. But I can share some basic pointers. These are the kinds of pointers you would show your friend because, let’s be honest, you’d rather not attend a wedding where the only thing the bride can say about her soon-to-be husband is “he’s always there.” And if you’re unsure about your own relationship motives, take a look at the following list and see where you land on love and attachment. Love is passionate. Attachment is apathetic. When you are in love, there is a fire within you. It can be an inferno of rage, or a kindled sweetness, but there is always that fire. Only when you can say you truly feel something is when you can say it’s love. When you are merely attached to another, you never really experience anything close to that fire. You have mild moments of irritation, anxiety, and a slew of other things, but nothing that resembles the blaze within from love. Love = Selflessness. Attachment = Self-centered. Real love is all about the other person. When you are in love, you want to place your partner’s needs above your own. Everything you do is for them and has a little part of you inside of it. 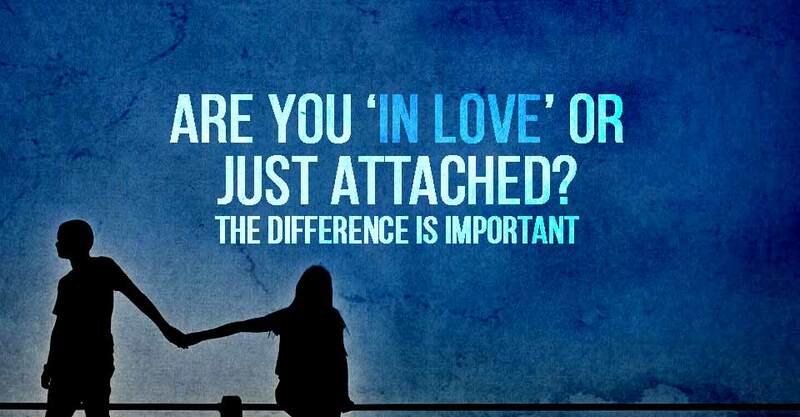 Attachment is all about you. You want someone there for you, want someone to support you, or want them to benefit you in some way. You aren’t looking out for them. You’re looking out for yourself. Love is freedom. Attachment is possession. Being in love is great because you don’t need to constantly be with your partner in order to feel affection, to understand how they feel, or to feel secure. You love them enough to trust the bond. When you are going through attachment, you feel like the only time you are “okay” is when you are with them. You can’t stand to be apart and when you are apart, you are always wondering what they are doing and with whom. Love empowers each other. Attachment takes sides. Feeling true love gives you wings to soar to new heights. It gives you renewed energy, and a sense of freedom. You share your dreams with your partner and listen to theirs with equal support. When it is attachment, there is only a power struggle. You call the shots, and you make sure you are never left out. The only decision that matters, is yours. Love has no time-limits. Attachment is timed. When you feel real love, that’s all there is. Time doesn’t matter. When you love someone, you will always love them, regardless of how things work out in the end. But attachment doesn’t work that way. Attachment has a deadline -an expiration date. Attachment isn’t real. Because neither one of you can grow in attachment, the beginning is already the end. Being in a relationship is never easy 100% of the time. Things that matter take effort. True love is a beautiful and remarkable thing. But just because you haven’t found the real deal yet, doesn’t mean you won’t. Be patient and try to reevaluate yourself and your relationships. If you are in an attachment, let it pass so you can both be open to experiencing the wonder of real love.